Frikadellen are enormously popular in Germany. Enjoyed hot or cold they are a delicious partner to most German beer styles and are present on the menus of beer gardens across the country. 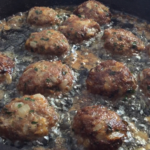 Frikadellen are pan-fried ground meat patties and are also known by other names such as ‘Fleischklops’ (meatballs), or ‘Buletten’ (also translated to meatballs and used in the Berlin area). In Austria they call them ‘Faschierte Laibchen’ (minced meat patties). What they are not is German hamburger patties. Because frikadellen are the original hamburger. Did you ever wonder why a hamburger is called a hamburger when there is no actual ham in it? The unofficial story goes (and there are similar ones in circulation) that once a man from the German city of Hamburg who had emigrated to NYC made frikadellen for a food fair. They smelled delicious and many were interested in buying them but they were also hot and he wasn’t very well prepared to serve them to the customers. He decided to sandwich them between pieces of bread. That way the customers could easily hold them and enjoy them while still hot. His frikadellen were very popular and people started referring to them as the hamburger sandwich, meaning the sandwich made by the man from Hamburg. There are many frikadellen recipes out there. The one I used is authentic Bavarian and Chris has it from working at Kaltenberg Castle. He scaled it down significantly of course, to serve four. You can easily double it if you want to treat more people to frikadellen. Or use the slider in the recipe card next to the word “Servings” to adjust the quantities of ingredients you will need. Typically they are made with a ground beef and ground pork mix. If you make them with all beef they will be leaner. Traditionally day-old white bread soaked in water is added but you also can substitute 1/2 cup oatmeal microwaved until really soft in 1/2 cup milk for added nutrition (still need to squeeze out liquid before you add it). You will need a good skillet to pan fry the frikadellen and this concludes the needed equipment. Frikadellen recipe anyone can handle. Frikadellen are the original hamburger. They are very popular in German cuisine and are often prepared bite-sized and served with radishes, mustard and open-faced chives sandwiches (Schnittlauchbrot) in beer gardens across Bavaria. 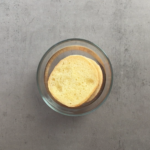 In a bowl of water soak the bread roll/bun. In about 20 minutes squeeze out all the water and crumble in a mixing bowl. While the bread is soaking heat the 1 tbsp cooking oil in a pan over medium heat and saute the onions until they soften. Set aside to cool them down. 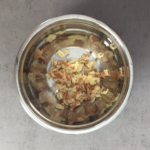 Add the chopped parsley to the crumbled roll, add the cooled softened onions, add the ground meat, the egg, the mustard, salt and pepper, paprika and marjoram and mix well. 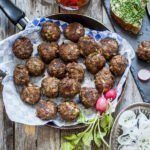 Shape into large patties or smaller bite-sized meatballs. Heat the cooking oil in a cast iron skillet or frying pan over medium-high heat. Add the patties or meatballs and quickly turn them, then reduce the heat to medium and fry until cooked, turning once. 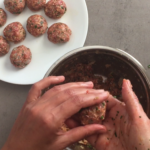 For larger patties allow 4-5 minutes per side, for smaller meatballs about 2-3 minutes per side, depending on their size. Serve with the radishes, mustard and Schnitlauchbrot. Butter the slices of bread. 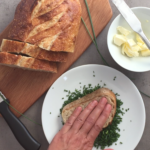 On a plate spread the finely chopped chives and press each buttered bread slice onto them, face down, so that the chives stick to the buttered surface. You now have small open-faced chives sandwiches. Carefully slice in half and serve. Clean the red radishes thoroughly and slice thin. 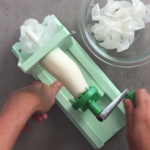 Peel the daikon and using a spiralizer or a potato peeler create thin spirals or shavings. Flavor with a few grains of sea salt and sprinkle with chives. 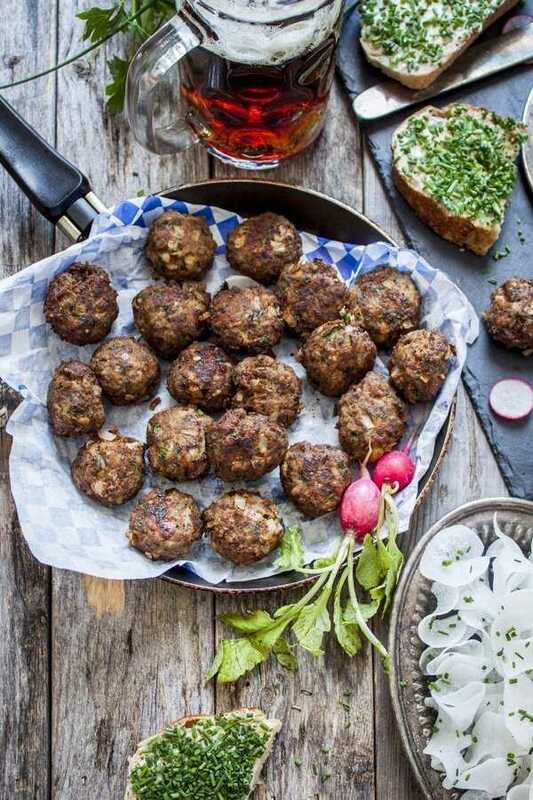 This recipe yields 8 large frikadellen patties or about 20 small meatballs. The Schnittlauchbrot (open faced chives sandwich is a traditional accompaniment to small frikadellen. So are the radishes. Both regular sized and smaller bite-sized frikadellen such as the ones you see in the pictures are commonly served in German beer gardens. In Bavaria they are also enjoyed during Oktoberfest. It is up to you how big you will shape them – the recipe is exactly the same. The larger ones are flatter like patties – I owe you a picture and will add one as soon as we make them next. The smaller ones are rounder like meatballs. Another beer garden favorite in Bavaria – Schnittlauchbrot, is commonly served alongside frikadellen – large or small. ‘Schnitt’ means cut, ‘lauch’ means onion and ‘brot’ means bread. 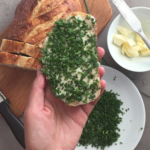 It is essentially an open-faced butter and chives sandwich, typically prepared with Bauernbrot – German Farmer’s bread. The bread is made with sourdough starter and both white and whole wheat flour, sometimes oats are added. 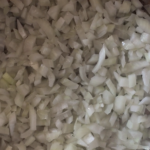 It is then sliced, buttered and pressed onto a layer of finely chopped chives. I wasn’t able to buy Bauernbrot and was short on time to bake a loaf so I used a crusty sourdough loaf instead. 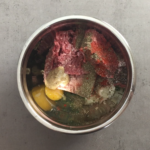 Another disclaimer – Chris was at the gym while I was making the food for this post and taking the pictures (it was going to be our lunch). Upon his return he nearly fainted when he saw my chives chopping job for the Schnittlauchbrot. I’ve been promised a chives chopping lesson. (Remember the split in half goat fritters? Similar situation). So try to chop your chives in smaller, visually appealing and more uniform bits than mine (eye roll). No, seriously. The larger frikadellen are commonly served with pan roasted potatoes or potato salad, pasta salad, mixed salad, steamed vegetables. In sandwich form they are presented on Kaiser rolls with mustard, frequently garnished with radishes or fried onions. The bite-sized frikadellen, in addition to Schnittlauchbrot, are accompanied by beer mustard and radishes – both the small red ones and thinly sliced/spiraled white radish called ‘Münchner Bierradi’ (Munich beer radish). It is the best known Bavarian radish variety, tastes peppery and pairs extremely well with beer and soft pretzels. The digestive juices it contains are known to help with overindulgence. One of these things where unless you try it, you will not believe it. The classic way to slice Munich beer radish is lengthwise, after peeling the outer skin, but most commonly it is spiralized. Use daikon radish instead (it is what I did) even though it lacks in peppery flavor. A spiralizer like the one I use in the recipe video will do the job or you can purchase a spiral attachment for stand up mixers. Do not underestimate radishes. The status they occupy as beer garden fare is nearly at par with sauerkraut. Radishes are served with Obatzda beer cheese dip, on various brotzeit platters and commonly on their own with just a sprinkle of chives and sea salt. And of course consider making some beer mustard just like the one you see in the pic below. This post contains affiliate links which help support our blog at no cost to you. Your meatballs look delicious, sure wish I had a couple! Hope you are having a great week and thank you so much for sharing with us at Full Plate Thursday! You make it look so easy – and it sure looks delicious! Thanks for sharing at the What’s for Dinner party! Now this is a meal! And can I tell you, I have never had a chive sandwich before! But that needs to end, now! And you know how I feel about ‘meatballs’! Pinned! Love Daikon radishes!! And your frikadellen look amazing! I can easily get why they are so popular in German beer gardens. All your recipes are keepers, guys!! Yes, totally fun to munch on bite-sized frikadellen and radish. Radishes really do go so well with beer, but when I first saw people eat them in Germany I was quite bewildered. Until I tried the combo, then I realized the true genius of the idea. Have a great weekend, Nicoletta! Wow, Kelsie! Your mom just discovered an entirely new use for the ‘soap’ bar. I need to send one to my mother-in-law, she also has several dogs. Yes, I love the story about hamburgers started out:) Have a great weekend! They are:) Thank you, Kelly! Hamburger sandwich! Love it! Though the idea of these smothered in gravy sounds pretty darn delicious too! Love all those chives…..are garden is overflowing with them; I’m pretty sure we have enough to supply the whole street, lol. That’s awesome, Dawn! 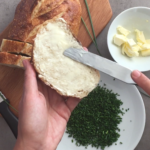 Chives sandwiches for all! I also really love chives in pasta, mmm..